From top corporate executives to famous celebrities like Jennifer Lopez, Ricky Martin and Eva Longoria, yoga has become the workout regime of choice for many people in the USA. There are so many different types of yoga out there, whether you want a more physically demanding class or an easy, relaxing, meditative class. Even if you're a seasoned yogi with a dedicated practice, flexibility and variation with any of the following styles could enhance your overall yoga experience and challenge you to break out of your comfort zone. "Hatha" describes all the physical practices of yoga. The term now is often used when a few different yoga styles are combined to create a simple class that's good for beginners learning to do basic poses. It's about stretches and breathing exercises. Even though the movements are slow, they are a great way to work out and relieve stress. Vinyasa classes are known for their fluid, movement-intensive practices. Each movement connects with either an inhale or an exhale. 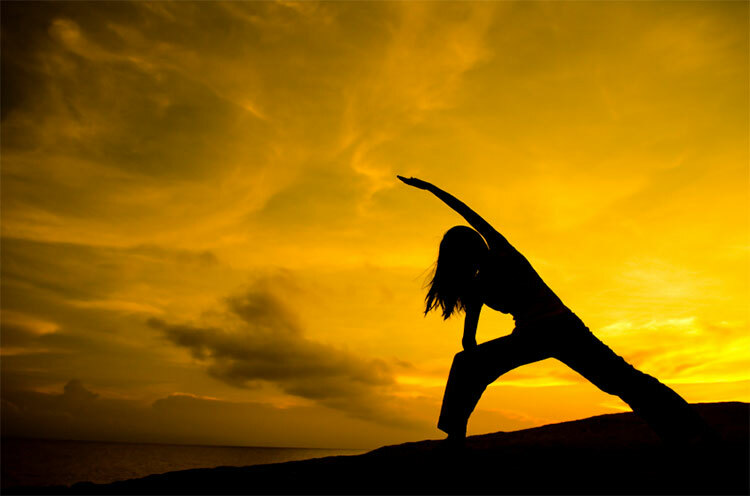 You can expect to move through a few sun salutations, warrior poses, balancing poses, back bends, and seated stretches. Each class ends in savasana, which is the final relaxation pose. Vinyasa teachers often play music to keep things lively. Iyengar is a great style of yoga for individuals who appreciate detailed instruction, or for those with injuries and who need a class that can accommodate their limitations. Practising Iyengar will help build strength, mobility, and stability. Here you’ll get nit-picky about precision and detail, as well as your body’s alignment in each pose. Generally, poses are held for a long time while adjusting the minutiae of the pose. Props, from yoga blocks and blankets to straps or a ropes wall, will become your new best friend, helping you to work within a range of motion that is safe and effective. If you are looking to sweat in yoga, this is the style for you. Bikram yoga features a sequence of set poses in a sauna-like room—typically set to 105 degrees and 40 percent humidity. Bikram yoga is best known for hot rooms and sweat dripping postures. This style is comprised of 26 postures performed in strict sequential order. Bikram chose these specific postures because he believes they systematically challenge the entire body—the organs, veins, ligaments, and muscles. Ashtanga yoga is considered a modern-day form of classical Indian yoga and involves a very physically demanding sequence of postures, so this style of yoga is definitely not for the beginner. It’s also known as “Power” yoga. It takes an experienced yogi to really love it. Ashtanga starts with five sun salutation A's and five sun salutation B's and then moves into a series of standing and floor postures. Jivamukti is mainly vinyasa flow-style classes infused with Hindu spiritual teachings. A series of chants usually open the beginning of class followed up by a series of poses that align with the five tenets of Jivamukti yoga (shastra (scripture), bhakti (devotion), ahimsa (non-harming), nada (music), and dhyana (meditation)) and philosophy. At its core, this style emphasizes connection to Earth as a living being, so most Jivamukti devotees follow their vegetarian philosophy. This style is all about releasing the kundalini energy in your body said to be trapped, or coiled, in the lower spine. Each pose is associated with a different breathing technique that is believed to intensify the effects of the posture. Kundalini strives to develop the mind, awareness, and consciousness. These classes really work your core and breathing with fast-moving, invigorating postures and breath exercises. These classes are pretty intense and can involve chanting, mantra, and meditation. Yin yoga is a slow-paced style of yoga with seated postures. The opposite of a faster moving practice like Ashtanga, Yin yoga poses are held for several minutes at a time. This meditative practice is designed to target your deeper connective tissues and fascia, restoring length and elasticity. Yin can also be a meditative yoga practice that helps you find inner peace. The classes are relaxed, as you're supposed to let gravity do most of the work. But which type of Yoga is the best now? This decision always depends on the reason for doing Yoga: Stress? Back Pain? Fitness? Typically Hatha yoga classes start at around $10 up to $30, so it's definitely worth trying it!